Sherrie Scraps with passion: No BRAINS about it....I WANT Candy! OMG Sherrie the card is too cute to spook and I love the cute tag. Sherrie this is just the cutest! That skeleton is so cute, love his face! 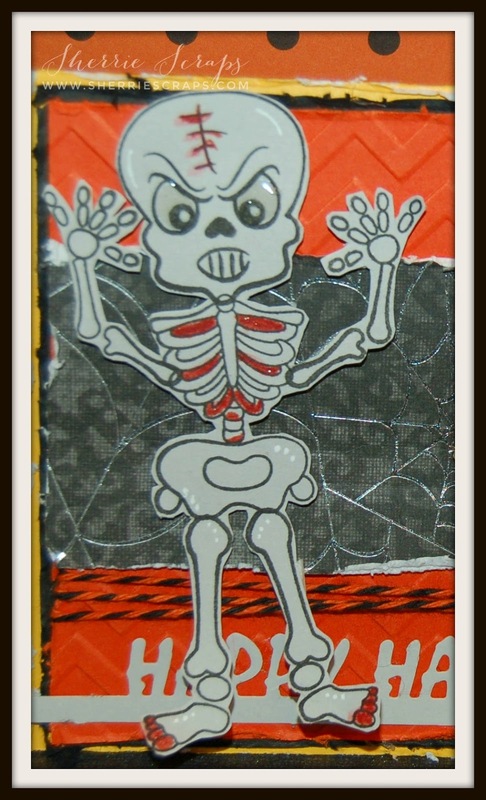 Sherrie ~ First of all your card is SPOOK~TACULAR!!! I LOVE that skeleton and all the details! The paper is super FESTIVE! Then the treat container ~ ADORABLE! Always so fun to see your creations! Thanks for joining us over at My Creative Time Designer Challenge! Btw ~ its gorgeous here today ~ hoping it is there too! Oh my gosh we finally got some nice cool weather and started to feel like Fall and then 80's today. Darn, I thought Fall was here. I'm sure you have nice Fall weather hopefully not too cold. Oh my gosh can you believe Halloween is next week? What is Arya dressing as? I just love this age they get so excited to collect candy! 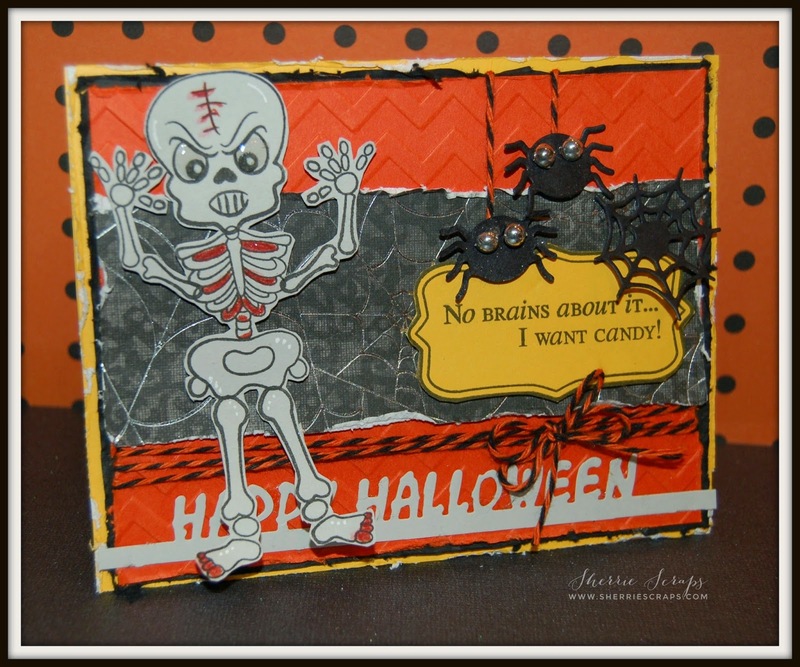 Like the spider eyes, skeleton & the distressing on this spook-tacular Halloween card. Heehee, I just love the card!! The menacing skeleton and that sentiment are fabulous together!! The spiders are so fun!! Their googly eyes are adorable!! What awesome projects my friend!! They make such a fun Halloween gift set!! Soooooooooooooo fun! LOVING the skeleton and the spiders!!!!!!! Now...this is a spooky card! That skeleton is super scarey and so are the spiders! Love the great papers you used for this card. I also love the fun treat you made to go along with the card. That tag is awesome! 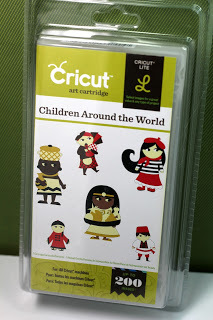 Fun card, all of the distressing looks fabulous! The embossed chevron background is my favorite! 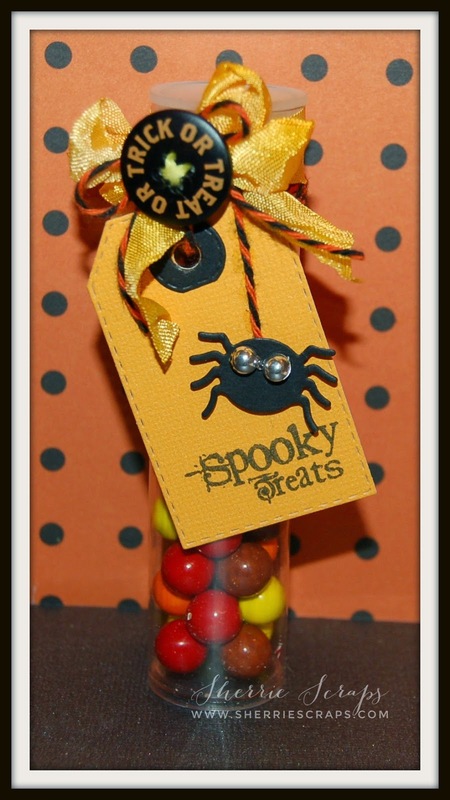 Love the fun treat you created to coordinate with your card! 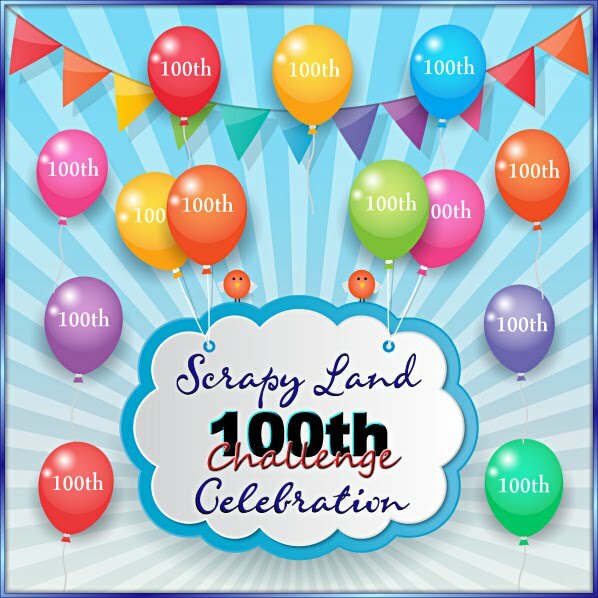 Just wanted to pop back over to thank you for joining our challenge over at Trendy Twine! This is so cute Sherrie, I love the sentiment!! Your Halloween treats are way too fun. That skeleton sure is spooky! Thanks for joining our “Spooky” Challenge this week at DoubleClick Skittles. was really fun! Love the added treat as well! Will make someone super happy this Halloween! So so fun Sherrie! Your card is too cute...nice matching treat! Have a GREAT weekend! What a cute card Sherrie, I love the distressed edges and the eyeballs! 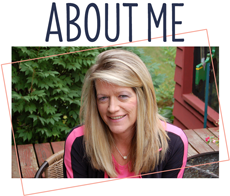 Sorry I haven't been around for a while, busy start to the school year but I'm trying to get back in the groove of blogging! Oh this is such a cute set of Halloween goodness, Sherrie. Love your fun treat. Thanks so much for linking up with us for the Trendy Twine Challenge. Your Skeleton is Too cute Too Spook! !Love it!! Super cute spiders and I love the Fun treat!!! Yummy! Oooo...spooky fun card and treat! Thanks for joining our challenge at Trendy Twine! What a spooky fun card my friend !!! The details are scary cute !!! This is so super AWESOME Sherrie!!! I just LOVE the color combo...that adorable skeleton and your matching treat! 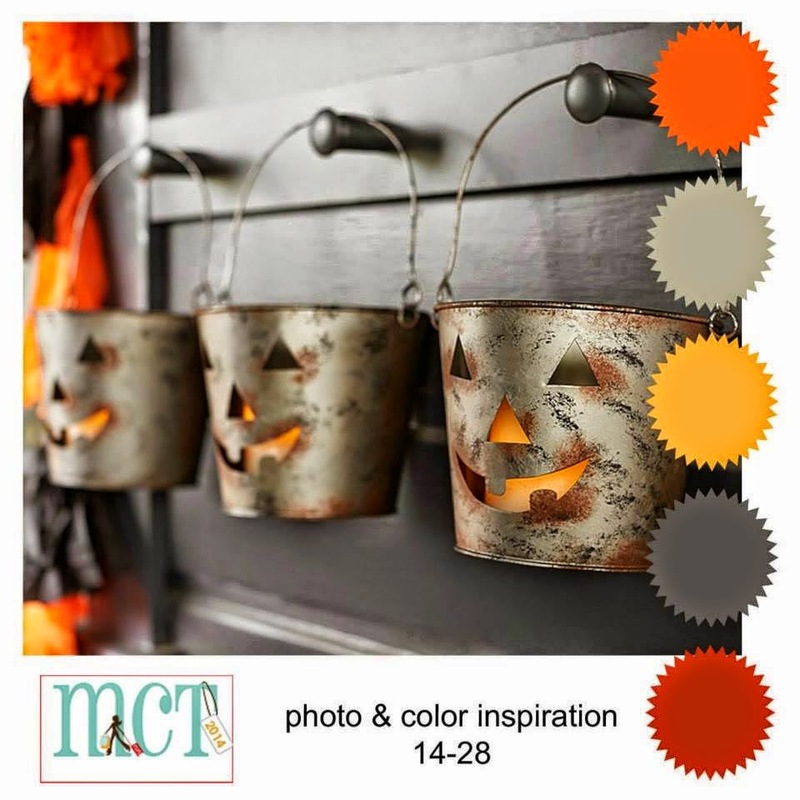 Thanks for sharing and playing along with the October Trendy Twine Challenge and the MCT Color/Photo Challenge! Oh my gosh, this is so cute!! I love that adorable spider and spooky skeleton! :) Great job with the distressing too! Thanks for joining this month's Trendy Twine Challenge! so stinkin cute! love it! LOL!! love that sentiment my friend, cute card and treat!! What a fabulous Halloween projects!! Love the card and the treat!!! Have a great day. Congratulations on your win at Trendy Twine!! Awesome projects!!! 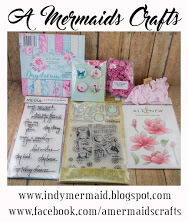 Thank you for joining us over at My Creative Time - Designer Challenge!!! Super projects, Sherrie! I LOVE your card! 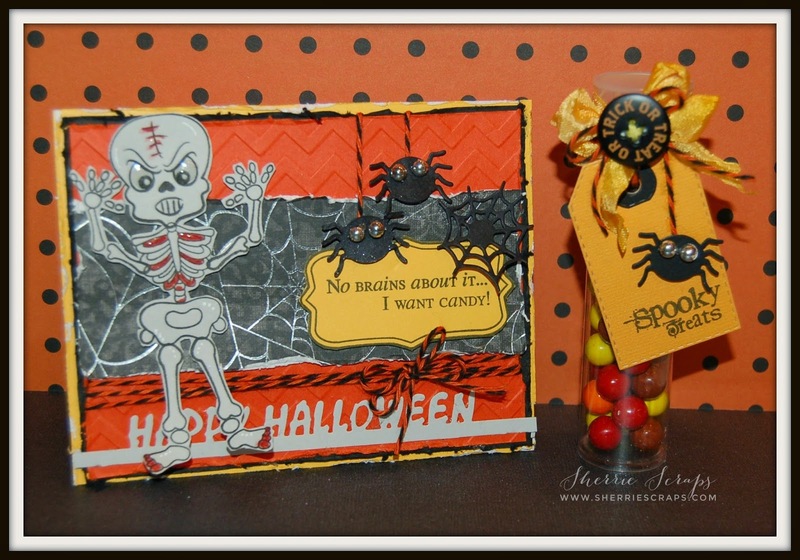 That skeleton looks fabulous on the torn paper edges and the little dangling spiders are such a great touch!